One hundred and nine Green turtle (Chelonia mydas) hatchlings released back to the sea in the ceremony attended by Regent of Aceh Tamiang District and another local leaders and stakeholders that was held in Beach Pusong Cium, Subdistrict Seruway, Aceh, Indonesia. In his opening speech, Regent of Aceh Tamiang, Hamdan Sati, ST, says “Saving sea turtle is important. Saving sea turtle and Painted Terrapin is like as saving our life, saving nature. Both are our biodiversity”. Meanwhile, Dedi Irvansyah, a chief of BKSDA Aceh Region I, state in his opening speech “It is a surprise for us. Previoulsy, we often heard the sea turtle population in west coast of Aceh. This is a first time for us in findings the population of this species in this area. So, this is important for conservation efforts”. Yusriono, chairman of Satucita Foundation, in his opening speech explaining of how the nest found, incubation needed. Beside that, also stated the progress of Painted terrapin hatching. The Green turtle hatchlings are a result of nest patrol that conducted by team of Satucita Foundation, staff of BKSDA Aceh, fishermen, since December 2015. 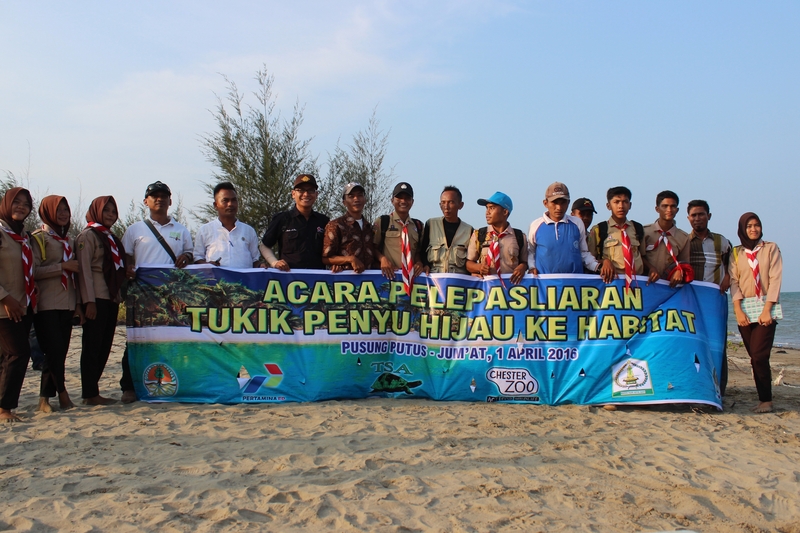 The patrol that intentionally to save Painted Terrapin (Batagur borneoensis) from unsustainable harvesting by some fishermen, incidentally found a nest of Green turtle in beach Pusong Cium on 5 January 2015. To avoid the predation from wild boar (Sus scrofa) and poaching from human, the team member of nest patrol secured and incubated the egg at hatchery that located on the beach. After incubated for 44 days, the eggs successfully hatched on 18 February 2016. Of 119 eggs found and incubated, 109 eggs successfully hatched (91,6 percent hatching rate). Ths is for second time the foundation release Green turtle hatchling. The first was last year. The findings of Green turtle nests is important, not only for sea turtle conservation, but also for ecosystem conservation. Based on information from fishermen, about four nest had been found on October to November 2015, before the nest patrol implemented by Satucita Foundation. The beach and estuary ecosystem is important for Painted terrapin and Green turtle. It has been for a long time, about more than of eight decades, people collecting sea turtle and Painted Terrapin eggs. So, it is not surprising the population of Painted Terrapin has been declined sharply, likewise for sea turtle population. “Although we do not know the number of Green turtle population here, and may be very small due to not many nests found in recent years, it is still important. It is like bring the Green turtle back to community, to this place. Even, it is for a first time for some people, especially students, seeing this beautiful and endangered species directly. Previously, fishermen always collecting the eggs when they found it on the beach. No body would like to incubate it and try to recover population here. May be this can be a good start for people here to start. Let us hope that hatchlings will survive and back to the beach for nesting in the future.”, said Joko Guntoro, founder of and programme director at Satucita Foundation. Beside of attending the ceremony, Regent of Aceh Tamiang and another attendee seeing the 538 Painted terrapin hatchling in the temporary pools, the hatchery, that located on the beach. The hatchlings will be moved to enlargement pool in the town in upcoming weeks, reared to reach about 12 cm in carapace length, before released back to the habitat, rivers, that planned will be held on October this year. The ceremony was attended by Regent of Aceh Tamiang District, Chief of Aceh Tamiang Fishery and Maritime Office, team of Satucita Foundation, representative of PT Pertamina EP Field Rantau, Chief (Camat) of Seruway Subdistrict, member of Aceh Tamiang House of Representative, Chief of Seruway Sector Police, Commander of Navy in Seruway, Chief of village (called Datuk), fishermen group, boy scout from some high school in Seruway. The patrol is supported by conservation grant from Chester Zoo, Houston Zoo, Turtle Survival Alliance. The boat, camp is supported by PT Pertamina EP Field Rantau. The ceremony is supported by Aceh Tamiang Fishery and Maritime Office.